Dr. Eva T. Fiastro grew up in the Baltimore area and has spent all but 4 years of her life in Charm City. After attending Notre Dame Preparatory School in Towson, she spent 4 years at the University of Mary Washington. In 2006, she earned her Bachelor’s of Science degree in Biology. Dr. Eva began her graduate career by earning her Master’s Degree in Biology at UMBC in 2008, finishing in 2012 when she completed her Doctorate in Dentistry at the University of Maryland Dental School in Baltimore. In dental school, Dr. Eva was part of Gamma Pi Delta, a Prosthodontic Honor Society. 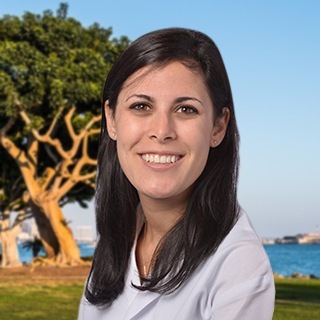 After graduating from dental school, Dr. Eva entered private practice. In her first year after graduation, she also taught as the attending Dentist at CCBC Dundalk Dental Hygiene School. Dr. Fiastro enjoys continuing education and has attended all but one American Dental Association conferences since graduating. She has studied with Dr. Gordon Christensen, a leader in the field of product testing and technique enhancement. Dr. Eva is Invisalign-certified. By aligning the teeth, she is able to provide a key component to comprehensive dental care. She is well trained in a variety of treatments, including fillings, veneers, crown and bridge, endodontics, oral surgery, and TMJ splint therapy. She is dedicated to making sure she gives each patient the most esthetic and functional end result, all while keeping comfort the utmost priority. Dr. Eva is married to her husband of 5 years, has a daughter, a dog, and another baby due in summer 2017. She enjoys gardening, dancing, and going on walks with her family. During the summers, she likes spending time at the beach. Her Cuban/Italian background has taught her how to cook good food, but most importantly, how to speak Spanish. Porque ella puede hablar en Español, ella puede proporcionar tratamiento en su idioma. Este le permite sentirse más cómodo en la officina.